Have you noticed that one of your shoulders is higher than the other? Maybe your spouse mentioned that you have been walking different. At the end of the day does your neck feel tired? Are you having unexplainable hip, knee, ankle or foot pain? Postural problems may be the cause of these disorders. The Chiropractors here at Sydney Wide Chiropractic spend so much time analyzing posture that it becomes second nature to watch how our patients get out of their cars and how they walk down the hall. We watch how a patient holds his or her head and whether they can turn their head from side to side. I catch myself analyzing posture and alignment all the time. Sometimes it gets me in trouble when my wife thinks I'm checking out another female as she walks in front of us. I quickly explain, "I bet she has back pain, her left hip is moving higher than her right." But I usually still get smacked in the head. The education that Chiropractors receive helps to determine which asymmetries are normal and which need chiropractic intervention. Adult diagnosed scoliosis is often a permanent condition. The patient's body has already adapted to the spinal curvature and correcting it would do more harm than good. In some instances, bones just develop differently on one side of the body and an asymmetry may be completely normal. It is differentiating between these conditions that is the chiropractor's expertise. For example: The insertion of shoe orthopedics is a precise science and the correct training is required to prescribe them effectively. 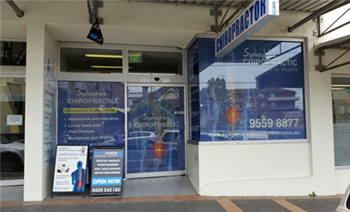 At Sydney Wide Chiropractic we analyze postural problems and correct them using appropriate chiropractic techniques.